... Papillon and Shetland Sheepdog. More pics on my recent Honeysuckle blog. They look good TT. It's nice to have something unusual in the garden. There are some of those Papilion dogs living near me. They are pretty but very noisy. Yes .. Papillons are beautiful little dogs. A very intelligent breed ... but they sometimes bark from boredom if not given company and mental stimulation ... but with the right owners, Papillons are wonderful companions. These definately don't have the right owners then. Love the silhouettes, TT, very unusual. 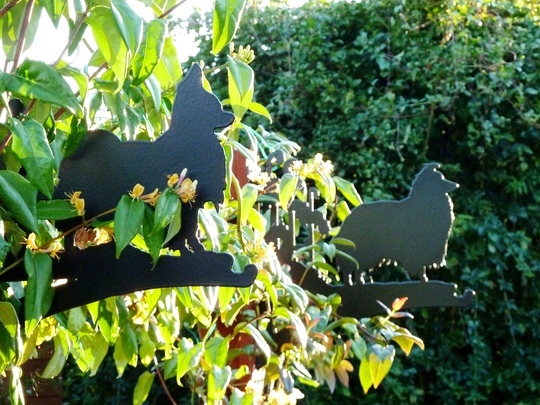 That does look stunning in the evening sunshine and I love the Silhouettes! TT, my two are asking where is your dachshund silhouette?! Where did you get these? They are seriously cute! Very clever photo TT, Honeysuckles are looking very good, always a favourite in the garden. An unusual and interesting photo TT much enjoyed. The Pap looks like my Frances :o) Nice pic.